The Vardar river (Greek: Axios) is the longest river in Macedonia and a major river of Greece. Vardar river is 388 kilometres long, and drains an area of around 25,000 km². The spring of the Vardar river, is one of the greatest natural beauties of the Gostivar region. There, near the village of Vrutok at an altitude of 683 meters, from the base of the mountain Shara rises the river Vardar. From the spring the riverbed of Vardar widens. Vardar river passes through Gostivar, then the Derven canyon Skopje, Veles, Demir Kapija canyon, and crosses the Greek border near Gevgelija, Polykastro (Macedonian: Rugunovec) and Axioupoli ("town on the Axiós - town of Vardar "), before flowing into the Aegean Sea in Central Macedonia west of Salonica (Macedonian: Solun) in northern Greece (Aegean Macedonia). The lowest point of the Republic of Macedonia of 44 meters above the sea level, is actually the river Vardar flows in Greece. Unfortunately, downstream from Vrutok, through the cities, the river Vardar has become a dump for the garbage of the negligent people. The Vardar basin includes two-thirds of the territory of the Republic of Macedonia, which some have also called "Vardar Macedonia" after the river. After the division of Macedonia in the Balkan Wars, the territory of today's Macedonia was called after the river - Vardar. The valley comprises fertile lands in the Kilkis (Macedonian: Kukuš) and Thessaloniki (Macedonian: Solun) prefectures and Gevgelija and other parts. The Vardar river is surrounded by mountains elsewhere, except the valley of Salonica. The superhighways Greece Interstate 1 in Greece and M-1 in Macedonia and E-75 run within the valley along the Vardar river entire length to near Skopje. 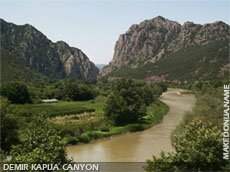 The Vardar river valley has given its name to the vardháris or vardarec, a northerly prevailing ravine wind which blows down the length of the valley to bring cold conditions to the Thessaloniki area of Greece. Vardarec occurs when atmospheric pressure over eastern Europe is higher than over the Aegean Sea, as is often the case in winter.